Last week, I hit one of my milestones of a hundred and one fans for my Skunk Hill Studio Facebook page. To celebrate, I thought I'd host a giveaway. No puppies, I promise! None of those in residence here, without or without their spots. 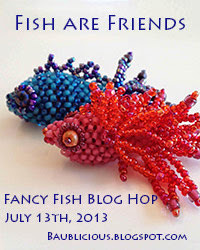 What I do have a is ton of beads (sort of spot-like), so I thought I'd give some of them away in two separate prizes. 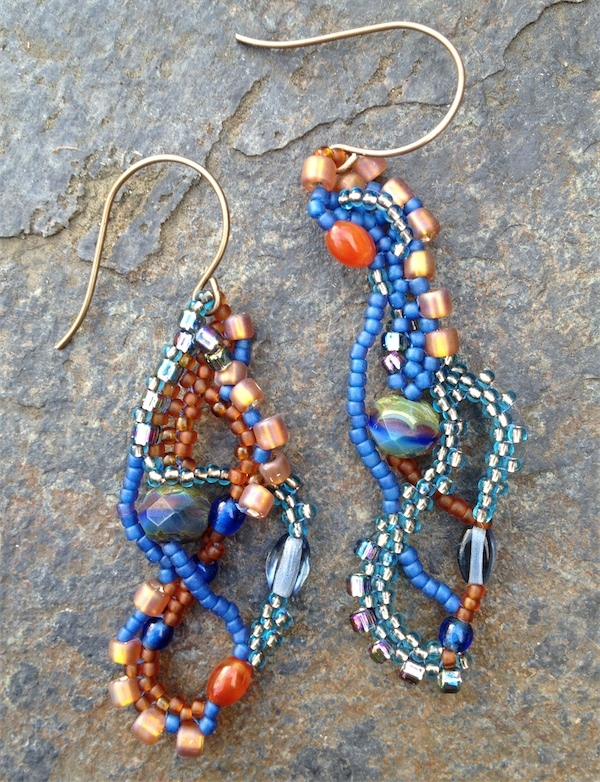 In the first prize, the beads are cleverly disguised as a pair of earrings. I've selected this pair at left. 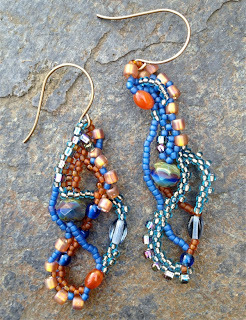 They're a pair of openwork freeform beading using right angle weave and peyote stitch with Vintaj antique brass ear wires and a $45.00 value. If you've followed my blog for a while, you might remember them from my January earring challenge. I personally think they're a lovely pair, and was tempted to keep them for myself. But, since I believe in the freedom of choice, I'll make you an additional offer. You're welcome to look through my Etsy store - if you see another pair you prefer, favorite it on Etsy and let me know. If you win the earrings, then the one you marked is yours. If you favorite more than one, make sure you let me know which is your top choice! Kit Package A: including both my Lacework Bracelets and my Corset Beads kits mentioned in my last blog post. 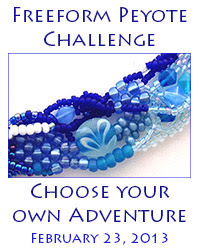 The prize will include both tutorials and all beads necessary to make a single-color lacework bracelet and two corset beaded beads. 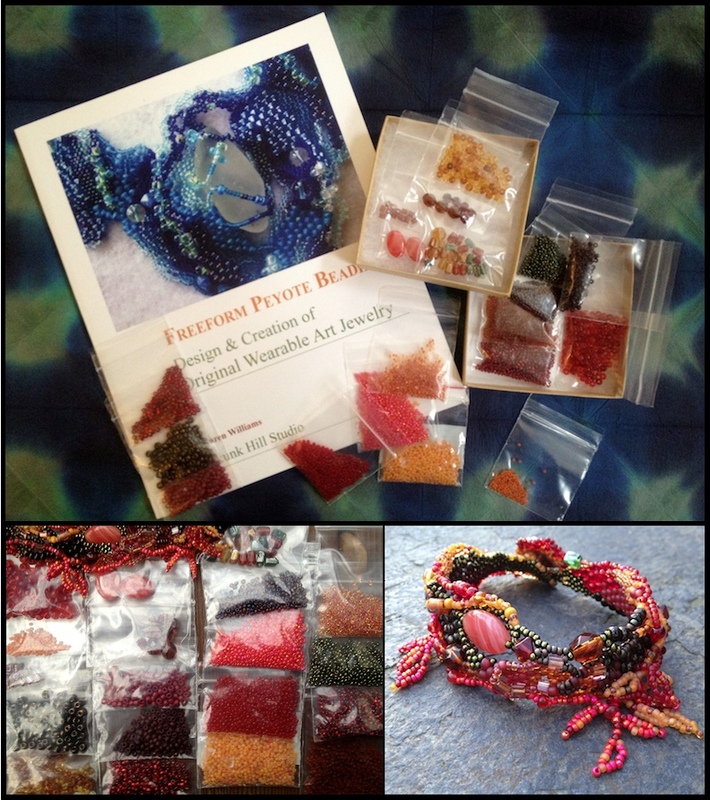 Kit Package B: my book, Freeform Peyote Beading and all of the beads necessary to make a bracelet similar to my Autumn Rain. During my original bead selection for the piece, I divided all of my beads into four portions. One of each was used to make the bracelet, while I held the remain three of each in reserve. Earlier this year, I combined the three remaining kits into two, to make the bead packets a little more robust. So this is a very limited edition kit. Both kits prizes have a $45.00 value. Since I'm celebrating my Facebook Fans, you need to be one to win. If you're not already a fan, it's not too late become one. :) Update: I'm already seeing a potential problem - if your Facebook profile name and Google profile name differ, please make sure there's an easy way for me to connect the two! 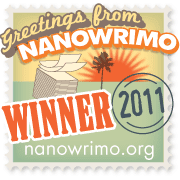 You can gain chances to win by any of the following (up to, I think four, chances): Comment here on my blog and/or on my Facebook page. Tell me what you'd like best or what you'd like to see more of. 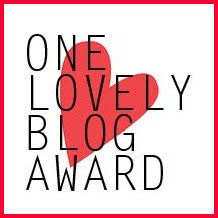 Post about this on your blog or Facebook, and let me know that you've done so. I'll do the drawing a week and a half from today, on Wednesday, June 27th. 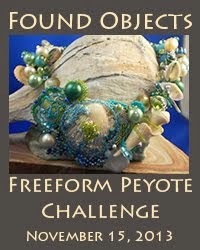 Wow, I would absolutely love to win your Freeform Peyote book. Oh yummy! I would love bead package B! Going to do the rest of the tasks, I'll be back! Thank you Karen! Ok, I posted on my facebook age, liked your Skunk Hill page, and posted on my blog! Congratulations, Karen. I became a Facebook Fan this morning. And if I were lucky enough to win your giveaway, I would choose Kit package A. I'm crazy for beaded beads, and I loved your corset beads in yesterday's post. Such a generous giveaway and congrats on the 101. I would love the Kit B freeform. I have done some freeform but would love to feel more comfortable with it. Lovely free form earrings-Fine Give Away celebration-You're so Generous! The freeform peyote kit looks like fun, would love to try it! I'd love to win a freeform kit, I'm a relative newcomer to freeform and am a bit stuck on Peyote, better with right angle weave. I'm sure I'd learn a lot from the package B! PS on FB I am Catherine Chinoy! WOW a kit from you would actually make me try this f******m thing you inspire me with!!! Karen, I'd love to have the kit. You can never have too many beads, and that's a great combo. Btw, I'm Liz Hart on FB. I would love the chance to win Kit A. Freeform Peyote is my favorite bead weave technique so this package looks awesome. I liked your FB page so let's hope....! I became a Facebook fan and left you a comment there.Congratulations on 101 fans! ooh. I'd like to win a kit if I won. And well done on 100! I LOVE the earrings but would also love just the bead kit(i already have the book!) as it would give me the kick to start my first freeform peyote bracelet. And those Spicy Colors are just divine! 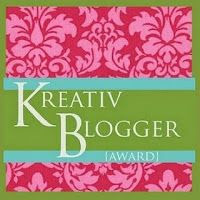 Love your work and would love to win a kit! What a great giveaway! I would love to win your giveaway! Congratulations on reaching the 101 milestone!